The Aeotec ZWA001 LED Bulb 6 is a ZWave Plus enabled screw-in light bulb for use with most ZWave controllers, hubs or software. It offers tunable white light that can be adjusted on demand or through a schedule programmed by ZWave. 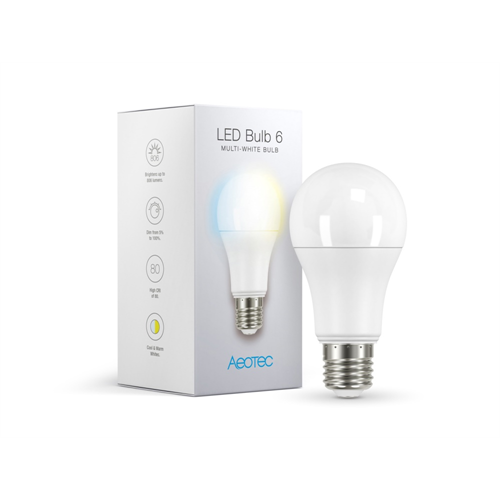 The LED Bulb 6 is compatible with most ZWave gateways including Samsung SmartThings, Vera, Homeseer, Hometroller. As a ZWave Plus certified device, it has a quicker response time, better wireless range of up to 490 feet in open space, and supports wireless security encryption. The ZWA001 Smart LED Bulb is dimmable and produces both warm and cool shades of white for daylight or warm light. It has a colour rendering index of 80 CRI and a 240-degree beam angle.